Before the 1920's, it was thought that galaxies were in fact objects within our own Galaxy, possibly regions forming individual stars. They were given the name ``nebula'', which we now use to denote regions of gas and dust within galaxies. The discovery of `nebula', fuzzy objects in the sky that were not planets, comets or stars, is attributed to Charles Messier in the late 1700's. His collection of 103 objects is the first galaxy catalog. 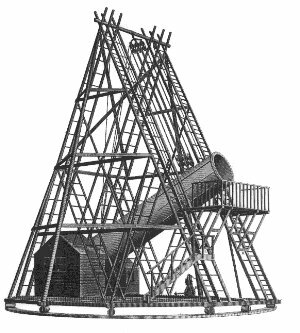 Herschel (1792-1871) used a large reflecting telescope to produce the first General Catalog of galaxies. 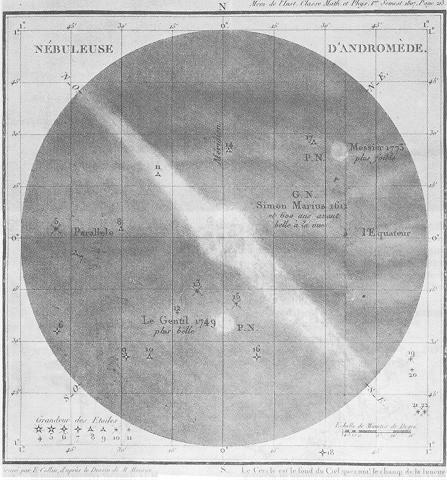 Before photographic plates, galaxies were drawn by hand by the astronomer. At the turn of the century Cepheid variable stars, a special class of pulsating stars that exhibit a particular period-luminosity relation, were discovered. In other words, it was found that their intrinsic brightness was proportional to their period of variation and, hence, could be used for measuring the distances to nearby galaxies. 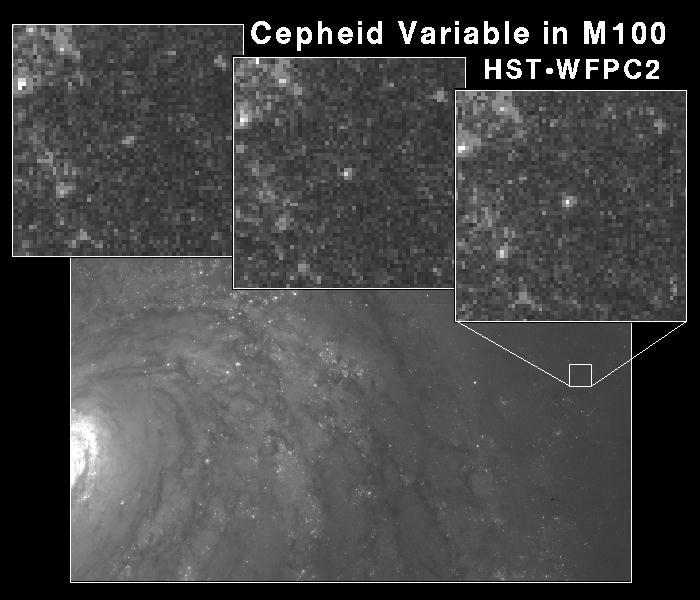 In the late 1920's, Hubble discovered similar Cepheid stars in neighboring galaxies as was found in our own Galaxy. Since they followed the same period-luminosity relation, and they were very faint, then this implied that the neighboring galaxies were very far away. This proved that spiral `nebula' were, in fact, external to our own Galaxy and sudden the Universe was vast in space and time. Although Hubble showed that spiral nebula were external to our Galaxy, his estimate of their distances was off by a factor of 6. This was due to the fact that the calibration to Cepheids was poor at the time, combined with the primitive telescopes Hubble used. Today we know that a galaxy is a collect of stars, gas and dust bound together by their common gravitational pull. Galaxies range from 10,000 to 200,000 light-years in size and between 109 and 1014 solar luminosities in brightness. Galaxies have certain features in common. Gravity holds the billions of stars together, and the densest region is in the center, called a core or bulge. Some galaxies have spiral or pinwheel arms. All galaxies have a faint outer region or envelope and a mysterious dark matter halo. The contents of galaxies vary from galaxy type to galaxy type, and with time. Almost all galaxy types can be found in groups or clusters. Many clusters of galaxies have a large, supergiant galaxy at its center which has grow by cannibalizing its neighbors. 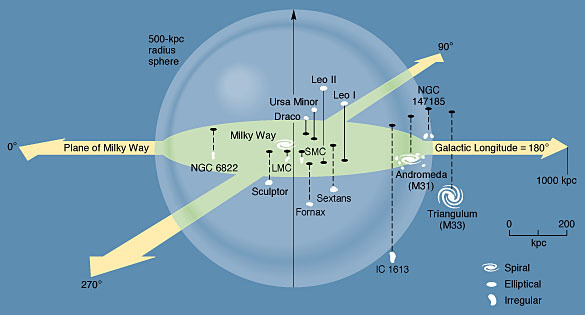 Our solar system is located in outer regions of a spiral galaxy we call the Milky Way. The nearest neighbor galaxy is Andromeda Galaxy (M31). Above is a 3D plot of most of the Local Group of galaxies, the population of galaxies within 1000 kpc if the Milky Way. Clustering of dwarf satellite galaxies around the great Milky Way and Andromeda spirals can be seen. Almost all current systems of galaxy classification are outgrowths of the initial scheme proposed by American astronomer Edwin Hubble in 1926. In Hubble's scheme, which is based on the optical appearance of galaxy images on photographic plates, galaxies are divided into three general classes: ellipticals, spirals, and irregulars. Galaxies of this class have smoothly varying brightnesses, steadily decreasing outward from the center. They appear elliptical in shape, with lines of equal brightness made up of concentric and similar ellipses. These galaxies are nearly all of the same color: they are somewhat redder than the Sun. Ellipticals are also devoid of gas or dust and contain just old stars. All ellipticals look alike, NGC 4881 is a good example (NGC stands for New General Catalog). Notice how smooth and red NGC 4881 looks compared to the blue spirals to the right. A few ellipticals are close enough to us that we can resolve the individual stars within them, such as M32, a companion to the Andromedia Galaxy. These galaxies are conspicuous for their spiral-shaped arms, which emanate from or near the nucleus and gradually wind outward to the edge. There are usually two opposing arms arranged symmetrically around the center. The nucleus of a spiral galaxy is a sharp-peaked area of smooth texture, which can be quite small or, in some cases, can make up the bulk of the galaxy. The arms are embedded in a thin disk of stars. Both the arms and the disk of a spiral system are blue in color, whereas its central areas are red like an elliptical galaxy. 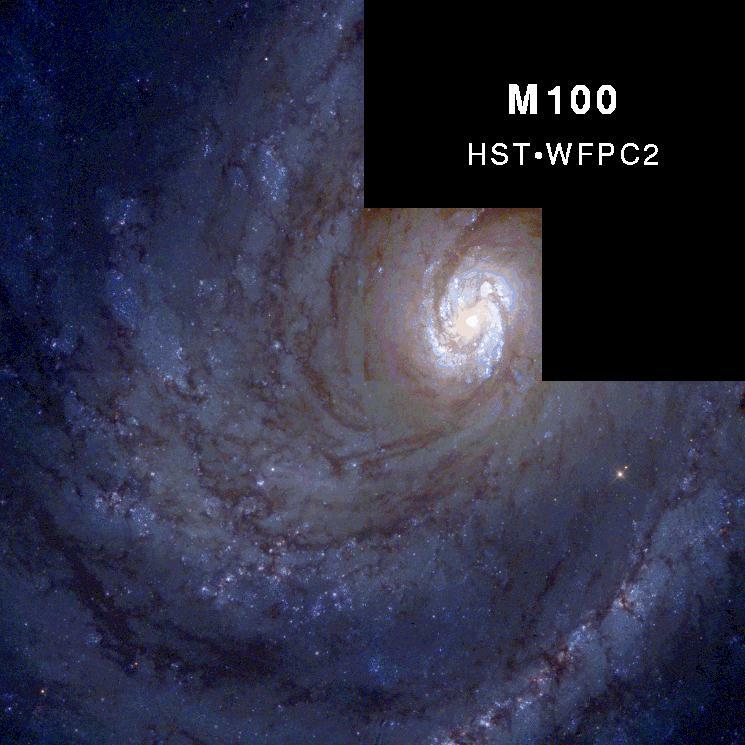 Notice in the above picture of M100 from HST, that the center of the spiral is red/yellow and the arms are blue. Hotter, younger stars are blue, older, cooler stars are red. Thus, the center of a spiral is made of old stars, with young stars in the arms formed recently out of gas and dust. The bulge of NGC 4639 is quite distinct from the younger, bluer disk regions. NGC 1365 is a barred spiral galaxy. Note the distinct dark lanes of obscuring dust in the bar pointing towards the bulge. A close-up of the spiral arms shows blue nebula, sites of current star formation. NGC 253 is a typical Sa type galaxy with very tight spiral arms. As spiral galaxies are seen edge-on the large amount of gas and dust is visible as dark lanes and filaments crossing in front of the bulge regions. Most representatives of this class consist of grainy, highly irregular assemblages of luminous areas. They have no noticeable symmetry nor obvious central nucleus, and they are generally bluer in color than are the arms and disks of spiral galaxies. NGC 2363 is an example of a nearby irregular galaxy. There is no well defined shape to the galaxy, nor are there spiral arms. A close-up of the bright region on the east side shows a cluster of new stars embedded in the red glow of ionized hydrogen gas. The various colors in a galaxy (red bulge, blue disks) is due to the types of stars found in those galaxy regions, called its stellar population. Big, massive stars burn their hydrogen fuel, by thermonuclear fusion, extremely fast. Thus, they are bright and hot = blue. Low mass stars, although more numerous, are cool in surface temperature (= red) and much fainter. All this is displayed in a Hertzsprung-Russell Diagram of the young star cluster. The hot blue stars use their core fuel much faster than the fainter, cooler red stars. Therefore, a young stellar population has a mean color that is blue (the sum of the light from all the stars in the stellar population) since most of the light is coming from the hot stars. An old stellar population is red, since all the hot stars have died off (turned into red giant stars) leaving the faint cool stars. The bottom line is that the red regions of a galaxy are old, with no hot stars. The blue portions of a galaxy are young, meaning the stellar population that dominates this region is newly formed. The one feature that correlates with the shape, appearance and color of a galaxy is the amount of current star formation. Stars form when giant clouds of hydrogen gas and dust collapse under their own gravity. As the cloud collapses it fragments into many smaller pieces, each section continues to collapse until thermonuclear fusion begins. Initial conditions for a galaxy determines its rate of star formation. 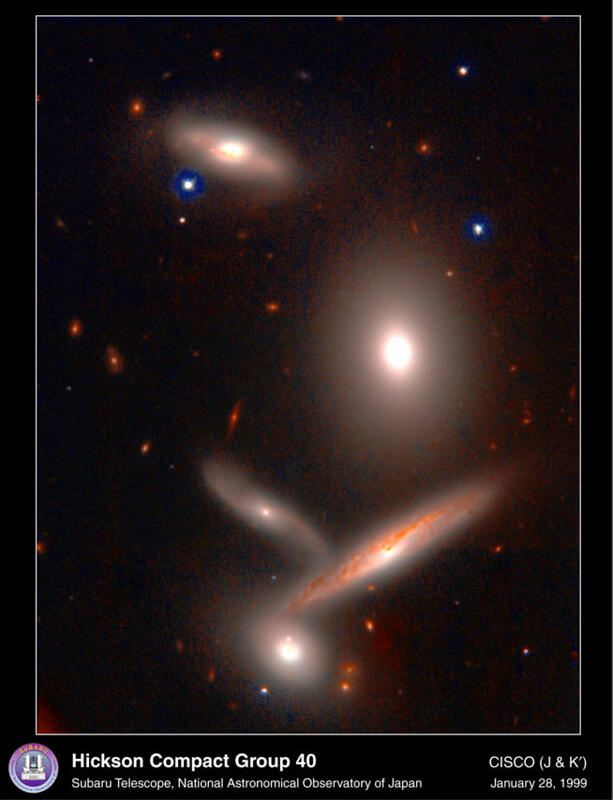 For example, elliptical galaxies collapse early and form stars quickly. The gas is used up in its early years and today has the appearance of a smooth, red object with no current star formation. Spirals, on the other hand, form slower, with lower rates of star formation. The gas that `fuels' star formation is used slower and, thus, there is plenty around today to continue to form stars within the spiral arms.